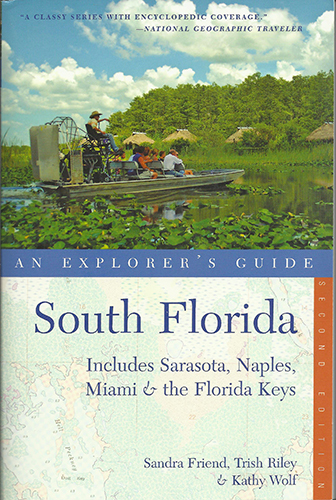 In its second edition, with new co-author Trish Riley taking over coverage of Florida’s southeast coast (where she lived for many years) this guidebook covers the southern part of our state’s natural and cultural attractions, hometown eateries, and just plain authentic experiences. South Florida: An Explorer’s Guide goes beyond the usual “Miami and the Keys” focus to bring you places with a genuine Florida feel. South Florida has captured the imagination of explorers since the Spanish set foot on these shores in the 1500s in search of gold, and if you get off the beaten path, you’ll find hidden treasures you’ll treasure. The farther south you travel, the clearer and bluer the oceans become. South Florida is on the tropical fringe, with native flora originating in the Caribbean growing as far north as West Palm Beach and Pine Island. It is where rare indigenous species roam, including the elusive Florida panther and the rare American crocodile. While the coastal regions are heavily populated, the central portion of the peninsula has rural towns, cattle ranches, and citrus groves until you reach the mighty swamps of South Florida, the Everglades and Big Cypress. We’ve made a point of finding what’s best in these places and including them, along with the well-known locales, to bring you the best South Florida has to offer. Softcover. 576 pages, b&w photos and maps.